It was a very hot day yesterday on the island. I was standing with one of my closest friends selling stuff at my Pop-Up stand and we got a bit to much of the sun. Yikes. My back is hurting. But it was a success, because we managed to sell quite a bit of our items. So thank you if you were one of those people. As we were standing there, we got to talking about the room for her son. He's 4 and she wanted to do a change to the room. 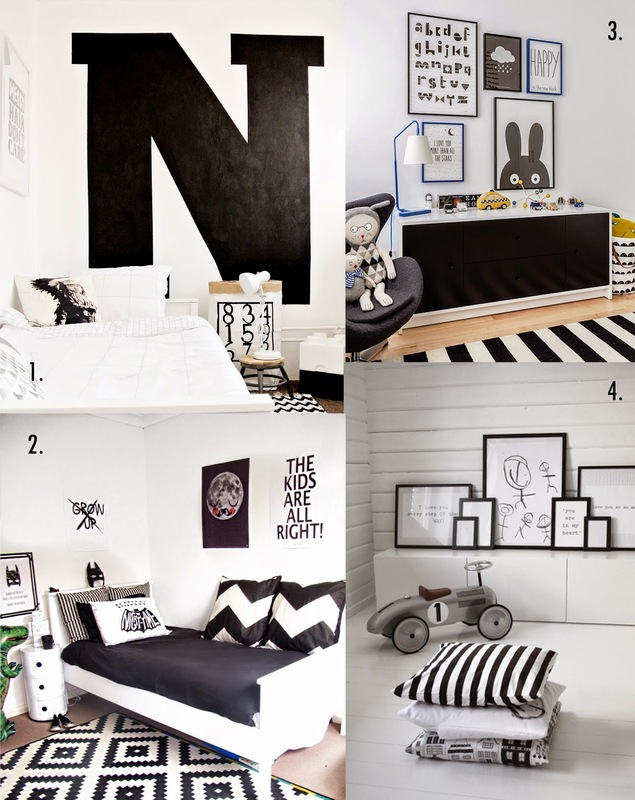 She had in mind to do a black & white room and ofcourse I'm giving some tips to make the room awesome. It's a good thing to make the room a bit mature as he can grow with the room, but keeping it still age appropriate. I went looking for some reference images to show her and I got these that will really fit him. What do you think? From the first (1) image I loved the idea of drawing his name or first letter of his name on the wall. It does make a statement. The second (2) image you can see pieces of Batman. This 4 year old boy loves his action figures. He's a great fan of Spiderman. So pulling some Marvel characters in the room will be awesome. I'm loving the black dresser in the third (3) image in combination with the white. And to make his little artworks pop, this idea in the fourth (4) image is really a great idea to make him proud of his artwork. Hoping to make this an awesome room. Do you have an awesome kids room? How did you go planning the room? Do share in the comments below.